Inspiring stories to share around the Chanukah lights. 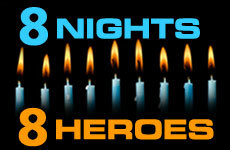 Chanukah is the time when we joyously recall the heroic Maccabees and the miracle of the oil that burned for 8 nights. Throughout Jewish history, there have been heroes in every generation. We thought it would be fun to choose 8 Jewish heroes, and each night, as we light the Chanukah candles, to read about a different hero. How did we choose these 8? We included a variety — those who demonstrated leadership qualities and others who reached great spiritual heights; young and old, famous and ordinary. The first 4 heroes in our list are historical figures, and the next 4 are alive today. Each has an interesting story to tell, and each fought to preserve our heritage so that we can continue to live as proud Jews today. Enjoy! If you’d meet Clara Hammer on the bus or in the supermarket, you probably would have smiled at her. She’s a sweet 93-year-old great-great-grandmother. But you’d never imagine that she is affectionately known as the “Chicken Lady,” responsible for feeding hundreds of poor families in Israel. What motivates Clara to help? Born in a small town in the Ukraine, Clara and her family survived three pogroms before running away to Romania. The Romanian border police refused her family entrance and they were jailed for five months. It was there that she experienced terrible hunger. And Clara decided that she will do whatever she can to alleviate hunger today. Today, Clara assists over 700 people and pays the butcher a weekly bill of over $1,000. The butcher has an entire computer dedicated to Clara. 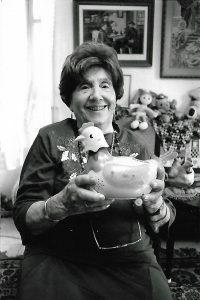 Her apartment in Jerusalem is filled with images of little chickens — stuffed chicken dolls, figurines and mugs. 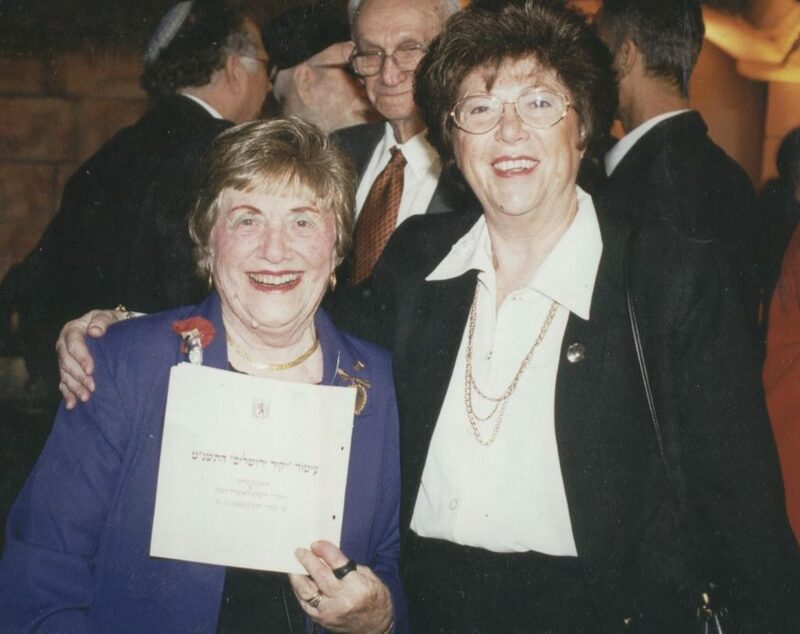 In 2008, Clara Hammer was awarded an honorary “doctorate in kindness” by Yeshiva University. She is a modern-day hero, showing us all what one person can achieve — with a little imagination and a lot of caring. May the memory of Chaya bat Meir serve as a blessing. Erev Pesach marks the 6th yahrzeit of the indomitable and legendary Clara Chaya Hammer a”h, the Chicken Lady of Jerusalem who, from the age of 70 until she returned her pure and happy soul to her Maker, trading in chicken wings for angel wings, a month short of her 100th birthday, fed hundreds of families and performed countless acts of kindness for the people of Jerusalem and its environs. 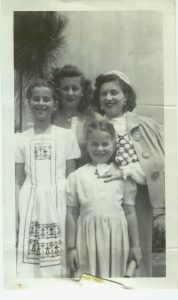 Her daughter, Rebbetzin Chana Homnick (not a spring chicken herself), and her great granddaughters, Elisheva and Shira, continue the legacy of Clara’s unremitting (and mostly anonymous) kindness. Due to her tremendous charisma, Clara’s chicken fund continues to thrive and Chana says that miraculously she is still able to maintain it. The fund needs about NIS30,000 shekel (about $8,000) a month to feed all the families who rely on it. The fund regularly provides for about 200 families a month, more on Rosh Chodesh and holidays. All donations go straight to the fund. Chana underwrites the cost of envelopes, stamps and notes (not chicken feed) herself. Modest and always devoted to her mother’s memory, Chana Homnick works hard to keep the fund alive. “I’m getting all the compliments now,” she chuckles warmly. Clara used to give anyone who visited her home two towels – one for milchig and one for fleishig. The milchig one had a picture of a cow and the fleishig had a picture of a chicken. Recently, Chana got a note from someone who said she treasures those towels. Clara was known for giving many gifts (and getting many gifts), all chicken-themed. Clara was always keen to make sure that if she sent money to a needy person, a personal note acco mpanied the check so that the recipient felt respected. Clara didn’t wait to be asked. One time she was on her way to the butcher when she saw tattered laundry hanging in a yard. She knocked on the door and offered help and the family gratefully accepted. There are so many people knocking on our doors in these beleaguered times asking for donations, but Clara stood out as the woman who was always looking to give. Looking being an active verb. She would notice when people needed, and what they needed, and she did everything she could to fill the void with energy absent in women half her age. When a friend of her granddaughter heard that Clara had died, she said mournfully, “Who am I going to go to now for moral support?” This woman who had experienced post-partum depression had gone with her new baby to visit Clara. 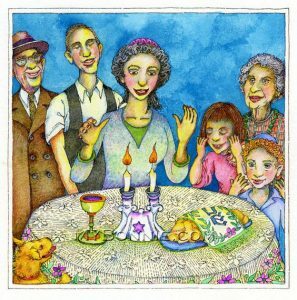 Clara started dancing with her and singing her signature song, Ashreinu ma tov chelkeinu and raised her spirits. Today, Chana scans the news and when she hears of someone who has experienced a tragedy and needs help, she contacts the person and offers to add him or her to the fund’s list of grateful recipients. Chana also continues her mother’s custom of sending out warm letters (and I mean letters, not notes) of gracious gratitude. 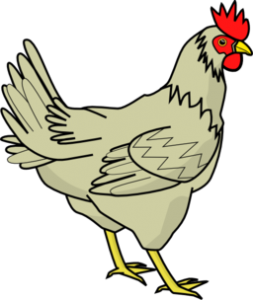 And the people she sends her letters of gratitude to are often children and grandchildren of the original donors who are continuing the family tradition of supporting the Chicken Fund. Donations come in from all over the world. About 20 years ago, a couple from Florida who were contributors to the Chicken Fund and were getting married sent Clara money to take some new olim for a night out. She took them out to a restaurant and they had a wonderful time. This couple continues to send contributions to the Chicken Fund to mark special occasions like anniversaries. Recently, this couple’s son became bar mitzvah and in honor of the occasion they sent Chana money to make a bar mitzvah celebration for some underprivileged boys. Chana contacted an orphanage and took 10 boys who had just become bar mitzvah out to a restaurant decorated just for the occasion. It was night filled with music and dancing those boys will never forget. From generation to generation, donation to donation, celebration to celebration, the Chicken Fund helps spread joy and make memories. Chana Homnick commissioned a book about her illustrious mother. Written by C.B. Gavant and published by Feldheim, The Chicken Lady of Jerusalem – A Life of Giving tells Clara’s story, beginning with her years as a little girl in the Ukraine tending to chickens, having no idea how much they were going to dominate her life and help her contribute to the lives of others. Proceeds from the sale of the book go to the fund. 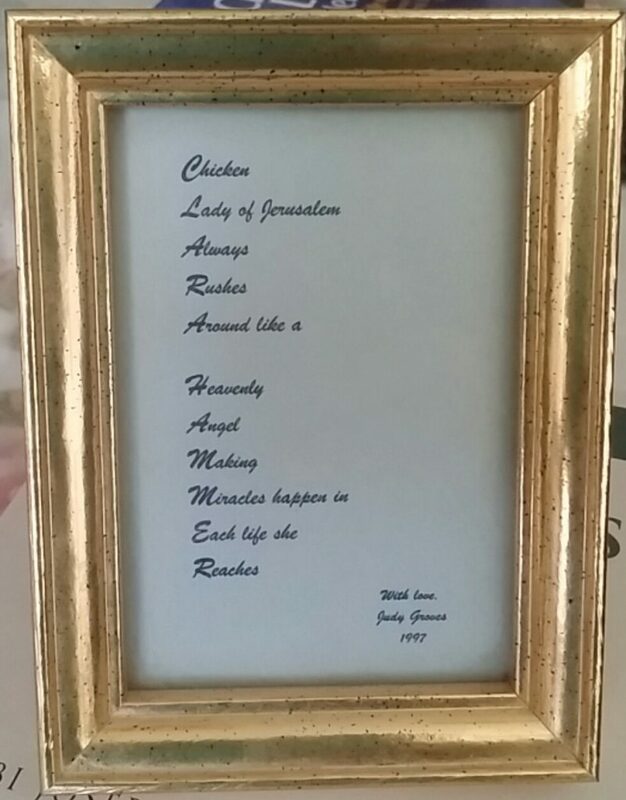 On this 6th year without the Chicken Lady we pay tribute to her entrepreneurialship, her singing talent, her dedication as a teacher, her charisma as a speaker, her vivaciousness, her love which she gave to four generations of progeny, her love for Eretz Yisrael, but most of all for her life’s work as a chesed lady. Lords and Ladies will come and go but there will always only be one Chicken Lady. About the Author: Rosally Saltsman, originally from Montreal, lives in Petach Tikvah. 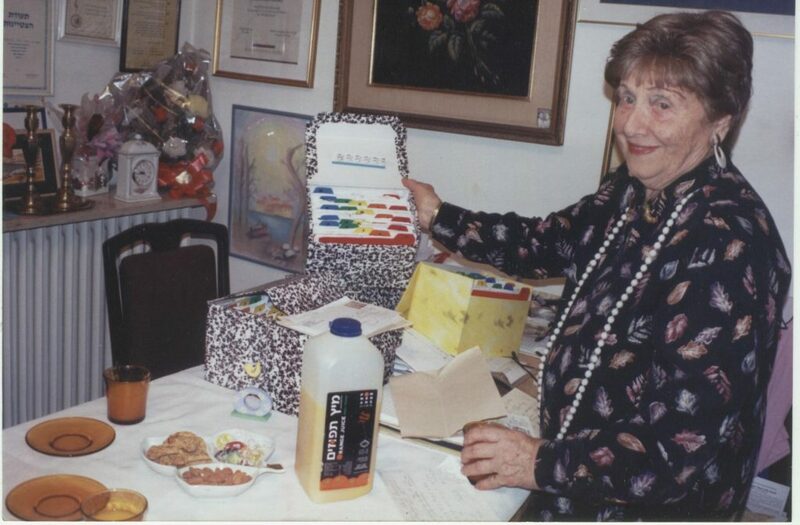 In 1999, Chaya Hammer was awarded the coveted Yakir Yerushalayim award for her contribution to the citizens of t hat city. Something about the young girl in front of her on line at Hacker, a butcher shop in Jerusalem, seemed familiar, although Chaya Hammer had never seen her before. Perhaps it was the empty basket slung over an arm covered by a threadbare sweater sleeve or the lank braids hanging alongside a too-thin face? “She reminds me of myself,” realized the older woman in surprise, as her mind whirled back to the distant memories of herself as a young new immigrant in the Promised Land. This was too much for Hammer to hear. “From now on, give that family chicken and ground meat every week— and put it on my bill!” she said. Some time later, the butcher asked her if she was interested in taking on another needy family. It never occurred to Hammer to refuse. 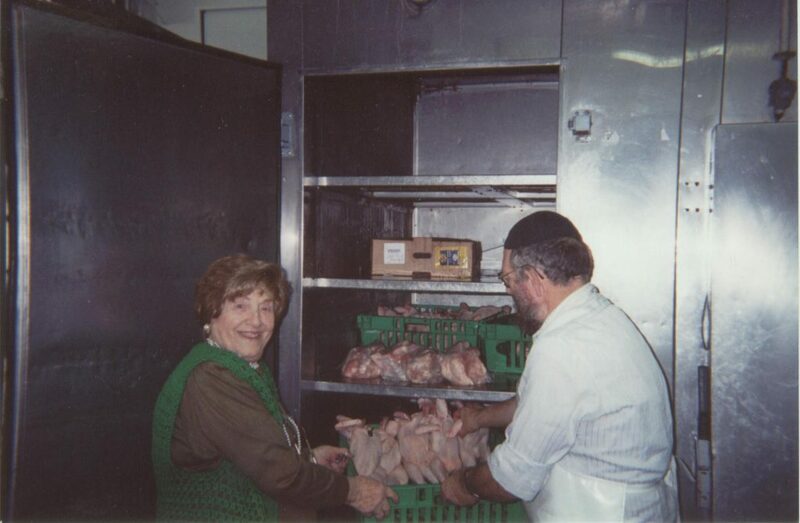 Over two decades later, this ninety-six-year-old powerhouse is responsible for providing 490 families throughout Israel with their weekly chicken and meat. Local recipients “buy” what they need at Hacker and “charge” it. For needy families who live a great distance from Hacker, Hammer sends over one hundred checks each month in attractive cards that wish the recipients “chodesh tov,” a good month. Even the stamps she chooses are decorative. By dressing up the donation, Hammer believes that the recipient will feel that he is receiving a present rather than a handout. Hammer’s average weekly butcher bill amounts to $1,000. Before the Jewish holidays, it’s usually $1,500. Generally, Hammer sends her “clients” directly to Hacker, although there are times when the brothers bring her attention to specific cases. The local families have no idea of the role she plays in their lives. “I prefer it that way,” says Hammer. “I like the fact that I can go to the butcher, stand behind someone I know I’m helping, yet she has no clue who I am. ”For those outside the local area, she has no choice but to reveal her identity. “Miriam” and her father have been receiving a monthly stipend since Hammer learned of their hardship. The crippled man would sit on street corners in Tel Aviv, playing the accordion in order to feed himself and his daughter. Not only did Hammer take care of them financially, but upon learning of Miriam’s dream to be a professional violinist, she got hold of a secondhand violin, had it fixed and then personally traveled to the city where Miriam lived to deliver it. Donors to Hammer’s “chicken fund” come from all walks of life—Jews and non-Jews, religious and unaffiliated. Most of the donors hear about Hammer’s efforts via word of mouth, or through articles. People have been known to ring her doorbell, hand her an envelope with money and escape before she can even say thank you. No one has ever requested a receipt; donors know that every penny goes directly to those who need it. Hammer personally pays for the hundreds of stamps needed monthly. “I, too, want to donate to this worthwhile cause,” she explains. Each donor receives a thank-you letter. As a concession to Hammer’s arthritis, first-time donors now receive a form letter, which is constantly updated. Even so, Hammer always tries to add a few personal words at the bottom, and always signs the letters herself. Repeat donors get handwritten letters. At this point in her story, tears well up in her eyes. “My Ima fell in the deep snow, and my father turned back to help her up. The smuggler guide would not let him go to her! He forced us on, leaving my Ima in the deep, cold snow, all alone in a harsh foreign land—she without us, us without our Ima. It was many, many months before we learned what had become of her. “Soon after, we were caught by the Romanian authorities and thrown into prison, adults and children alike. For five long months, we received nothing more than a small ration of bread and water daily. Eventually, word of our imprisonment trickled out, and the local Jewish community managed to arrange our release. We finally found our Ima in a hospital, alive but ill.
Hammer’s mother never fully regained her strength; she contracted tuberculosis. 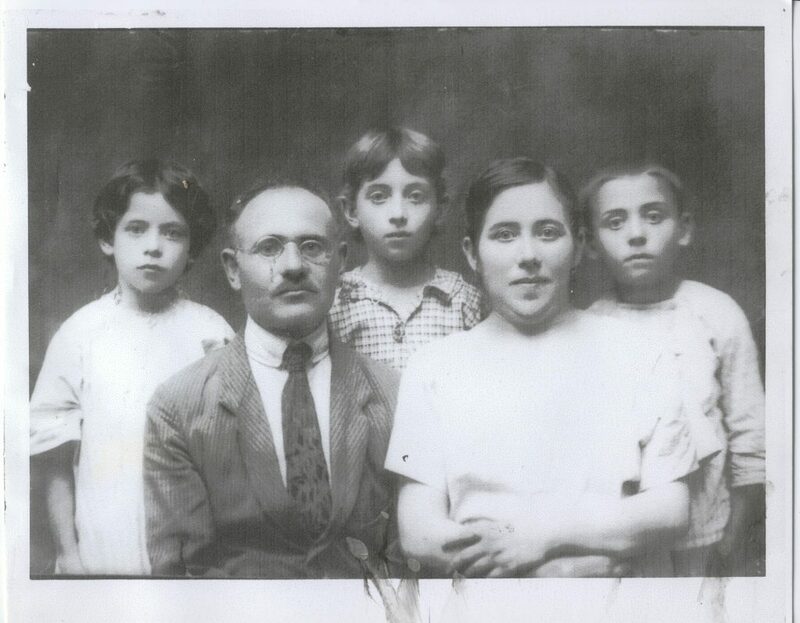 Hoping to find a cure for their mother’s illness, the family moved to the United States. Nevertheless, at the age of thirty-four, Hammer’s mother died. Eventually, Hammer’s daughters also made it to Israel, and now, says Hammer, five generations of her family live in the country. It’s this thought that keeps Chaya Hammer going. Ninety-six-year-old Hammer manages the files for the 490 families throughout Israel to whom she provides chicken and meat every Shabbat. Michelle Borinstein was born in South Africa, moved to the United States and is finally home in Yerushalayim, where she lives with her husband and children. She has had numerous articles and poems published in a variety of publications and is currently writing a number of children’s books. Every Thursday, Sheina Homnick, 18, runs an errand for her grandmother. It’s a simple one, to be sure, but laced with kindness just the same. Venturing from her grandmother’s apartment to a butcher shop three blocks away in Jerusalem’s Sanhedria neighborhood, she delivers a check to the proprietors, the brothers Moti and Alti Hacker. In 1999, the checks totaled 156,070 shekels, roughly $40,000. The money constitutes a debit account that enables 132 impoverished families to deck their Shabbat tables with chicken and flanken, roasts and soy burgers—whatever it takes to feast like royalty on the holiest night of the week. ns. And they say ‘thank you’ to the butcher, nothing to me.” Though she’s garnered some press coverage and last year received Jerusalem Mayor Ehud Olmert’s highest citizenship honor, Hammer is a do-gooder who believes in Maimonides’ dictum that charity is most selfless when it is anonymous. 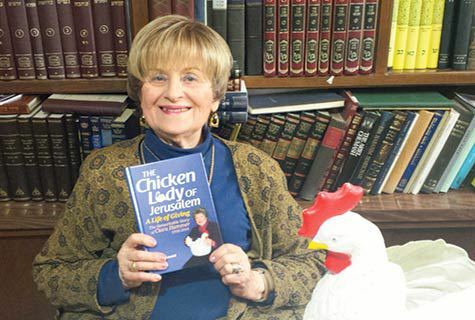 Nevertheless, she’s become known as the Chicken Lady of Jerusalem, a title she wears with pride, judging by her Chicken Lady Tshirt and all the chicken tchotchkes that fill her nest. 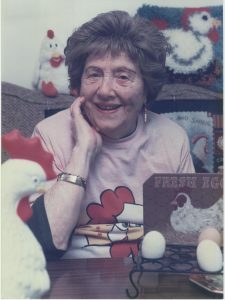 There’s a chicken pillow on the sofa and a chicken needlepoint on the wall, a chicken candy dish, chicken (no piggy allowed) bank, chicken fly swatter, chicken mug, chicken tea kettle and chicken windup doll that struts to (what else) the “Chicken Dance,” all gifts from her legions of donors in Israel and the United States. Chicken Feed Clara Hammer makes sure no one goes hungry on Shabbat. “The Chicken Lady of Jerusalem” not only distributes food, but finds clothing and other essentials for needy people. Contributors just keep appearing. Recently, a man rang her bell, stuck out a hand clutching 500 shekels and rushed back to his waiting taxi. 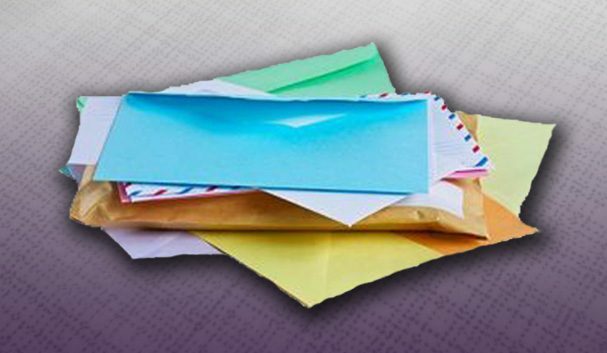 An acquaintance in Chicago mails $500 twice a year. He, too, appeared unexpectedly and, although the Chicken Lady was out, he left a bag filled with cosmetics (his line of work), fruit and a check. The Jewish Agency occasionally brings by American kids who chomp on popcorn as Hammer spins her tale. Hammer gives the word “organization” new meaning: her ledger book (43 pages last year alone) lists the names of each contributor, with penciled marks denoting those who have already been sent thank-you notes. Among her few concessions to age are form letters to first-time givers. Veteran contributors qualify for handwritten replies. The Chicken Lady has a knack for bringing work upon herself because, it turns out, she’s not satisfied being just the Chicken Lady. Not long ago, the Orthodox newspaper HaTzofeh reported on a crippled man playing an accordion for his food on the streets of Tel Aviv. So Hammer sent—and still sends—a monthly check for 300 shekels, along with an extra 200 shekels for t he man’s 14-year-old daughter. That’s because the girl, Nika Sapozhnikov, attends the Givatayim Conservatory and dreams of a musical career. But with the family in dire straits, she had no money for a violin. So the Chicken Lady temporarily became the Music Lady. Hammer secured an old, lovely instrument from a friend, paid to have it repaired and trekked to the Sapozhnikov home, where an appreciative Nika regaled her with Vivaldi, Bach and Mozart. Hammer’s own background lacked such benevolence. She and her parents, brother and sister fled their native Vinograd, Ukraine, during the pogroms of 1917. Smugglers took them across the river to Romania, but the family was caught and imprisoned in Galatz for three months. “We were rationed out a bit of water and a piece of bread,” Hammer recalls. The beleaguered family eventually reached Palestine. “When we were in Haifa, we lived in a tent and had nothing to eat. Between ages 10 and 14, I went to bed hungry. I know what hunger is. I have never forgotten it.” They finally made it to the United States, where they settled in Pittsburgh and where Hammer’s father, Meir, opened a grocery store. Strangely enough, the prison experience was partly responsible for Hammer’s amateur singing career. A guard promised Hammer’s father he’d give Clara a chocolate if she could master a Romanian song after he sang it three times. She did, and won the chocolate, the first she’d ever tasted. Now, 80 years later, the elderly widow can still belt out the young girl’s tune, “Deschide, Deschide, Fereastra” about a boy calling for his girlfriend on the other side of the window to come in and eat. A few minutes later, unprompted, she offers up “A Yiddishe Mama,” clasping her hands, her palms upward, eyes closed. Hammer has always loved music. Her photo album is filled with programs that list Clara Hammer as providing the vocal entertainment at Jewish organization events in Los Angeles and Brooklyn, where she and her husband Ephraim taught Hebrew for more than 40 years before immigrating to Israel in 1969. “It’s a wonderful feeling not to be selfish, to be concerned,” says Hammer, closing the album. “I could go to lunch three, four times a week with the girls. They go to the Malcha Mall to try on clothes. What do I need it for? 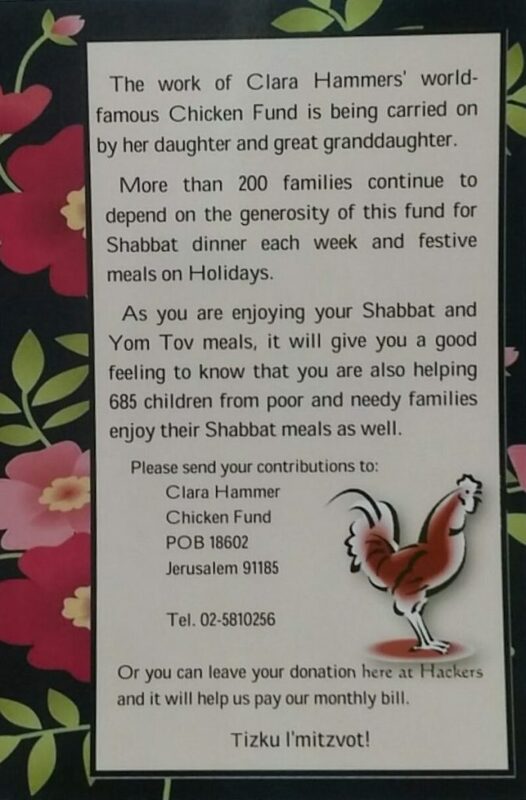 The work of Clara Hammer’s world-famous Chicken Fund is being carried on in her memory by her daughter, Chana Homnick, and her great granddaughter. We provide chickens to more than 900 children every week and their families. More than 250 families continue to depend on the generosity of this fund for Shabbat dinner each week and festive meals on holidays. 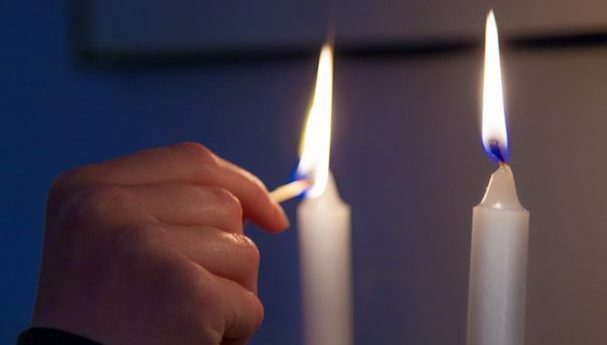 With your help we can restore the sense of peace and contentment on Shabbat to these homes. 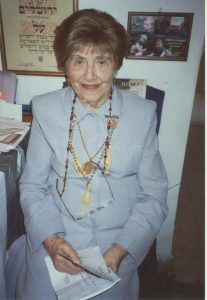 Clara Hammer, who passed away just before her 100th birthday, was known affectionately as “the Chicken Lady of Jerusalem.” She was honoured with a Yeshiva University Doctorate of Kindness and received many other awards, including those denoting her as a Yakirat Yerushalayim and Eishet Chayil. So, when yo enjoy your Shabbat and Holiday meals with your family, please remember that your donation enables the needy to enjoy their Shabbat and festive Holiday meals as well.